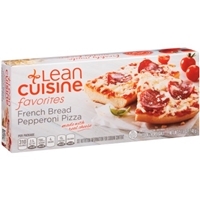 Crust: (enriched flour [wheat flour, niacin, reduced iron, thiamine mononitrate, riboflavin, folic acid], water, yeast, soybean oil, sugar, soluble corn product, dehydrated garlic), water, reduced fat mozzarella cheese (pasteurized part skim milk, nonfat milk, cheese cultures, modified food starch (ingredient not in regular mozzarella cheese), salt, vitamin a palmitate, enzymes, pepperoni (pork, beef, salt, spices, dextrose, lactic acid starter culture, oleoresin of paprika, flavorings, sodium ascorbate, natural smoke flavor, sodium nitrite, bha, bht, citric acid), tomato paste, seasoning (maltodextrin, modified cornstarch, sugar, salt, dextrose, spices, spice extractives, dehydrated garlic, citric acid, xanthan gum), 2% or less of parmesan, romano, asiago cheese blend (parmesan cheese [pasteurized part-skim milk, cheese cultures, salt, enzymes], romano cheese [pasteurized cow's milk, cheese cultures, salt, enzymes], asiago cheese [pasteurized milk, cheese cultures, salt, enzymes]), dehydrated garlic, spice.contains: milk, wheat ingredients. 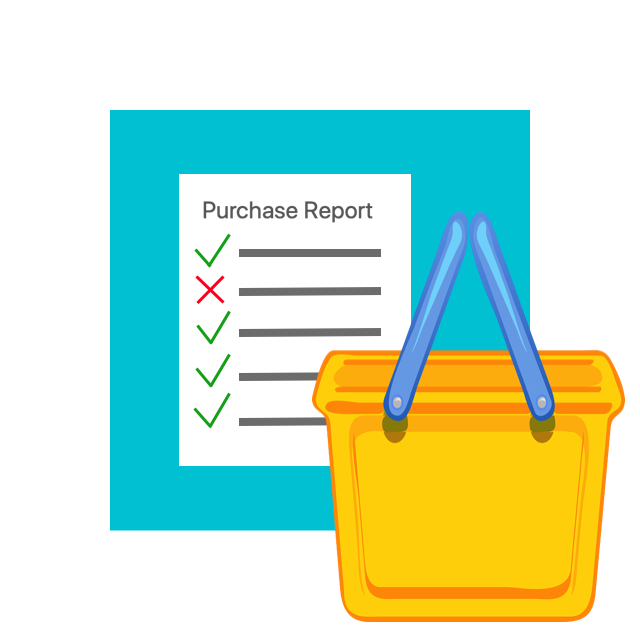 Bread (enriched bleached wheat flour [wheat flour, malted barley flour, niacin, reduced iron, thiamine mononitrate, riboflavin, folic acid], water, yellow cornmeal, contains less than 2% of rice flour, yeast, salt, soybean oil, sugar, cultured wheat flour, vinegar, fumaric acid, acetic acid, citric acid, lactic acid, mono and diglycerides, ascorbic acid, wheat gluten, enzymes, soy lecithin), water, pepperoni (pork, beef, salt, spices, dextrose, lactic acid starter culture, oleoresin of paprika, flavorings, sodium ascorbate, natural smoke flavor, sodium nitrite, bha, bht, citric acid), tomato paste, reduced fat mozzarella cheese (cultured milk, and non-fat milk, modified corn starch [ingredient not in regular mozzarella cheese], salt, vitamin a palmitate, enzyme), romano, parmesan, & asiago cheese blend (pasteurized part-skim milk, cow's milk, cheese cultures, salt, enzymes), seasoning (maltodextrin, modified food starch, sugar, salt, dextrose, spices and spice extractives, dehydrated garlic, citric acid, xanthan gum, sodium benzoate [preservative]), contains 2% or less of: soybean oil, garlic powder.contains: milk, wheat, soy ingredients. 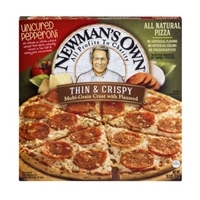 Brand/Manufacturer: Newman's Own Newman's Own, Inc.
Multigrain crust (wheat flour, water, vegetable oil [corn oil, extra virgin olive oil], flaxseed, yeast, sugar, salt, whole oat flour), low moisture part-skim mozzarella cheese (pasteurized part-skim milk, cheese culture, salt, enzymes), sauce (tomatoes [diced tomatoes, tomato juice], water, tomato paste, extra virgin olive oil, red wine vinegar, salt, sugar, spices, garlic [dried], onion [dried]), uncured pepperoni no nitrate or nitrite added except that which naturally occurs in sea salt and celery juice concentrate (pork and beef, sea salt, natural spices, evaporated cane juice, lactic acid starter culture, natural flavorings, [including celery juice concentrate], oleoresin of paprika), parmesan cheese (part-skim pasteurized milk, cheese cultures, salt and enzymes), parsley.contains: milk, wheat. 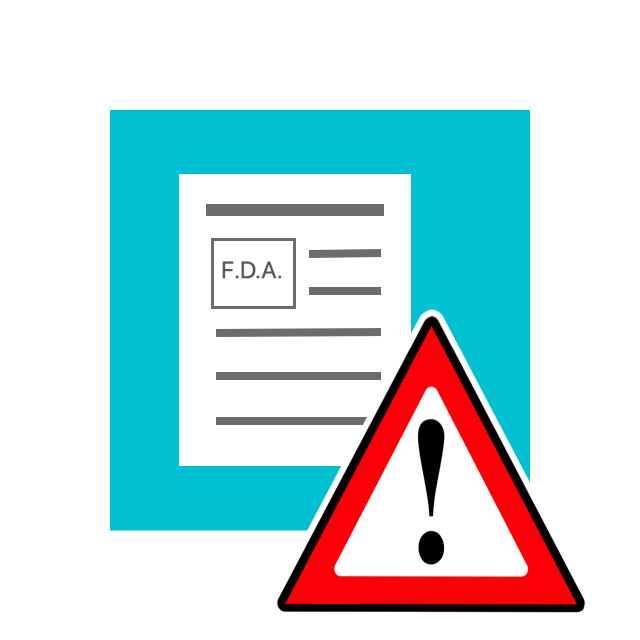 Crust (water, enriched unbleached wheat flour [flour, malted barley flour, niacin, reduced iron, thiamine mononitrate (b1), riboflavin (b2), folic acid], whole wheat flour, enriched wheat flour [flour, niacin, reduced iron, thiamine mononitrate, folic acid], contains 2% or less of acacia gum, yellow cornmeal, sugar, glucose syrup, dextrose, fiber, dough conditioners [sweet whey, ammonium sulfate, l-cysteine, isolated soy protein, mono and diglycerides, modified cellulose, soybean oil, soy lecithin], dehydrated garlic, dehydrated onion, olive oil, salt, baking powder [sodium acid pyrophosphate, sodium bicarbonate, corn starch, monocalcium phosphate]), reduced fat - reduced sodium mozzarella cheese (part skim milk, nonfat milk, modified cornstarch, cheese culture, salt, potassium chloride, flavors, annatto, vitamin a palmitate, enzymes), sauce (tomato puree [water, tomato paste], modified food starch, salt substitute [sodium chloride, potassium chloride, sodium gluconate], sugar, garlic powder, spices, onion powder, xanthan gum, acetic acid, citric acid, dextrose, natural flavor, extractives of paprika), pepperoni (pork and beef, salt, spices, dextrose, lactic acid starter culture, oleoresin of paprika, flavoring, sodium ascorbate, sodium nitrite, bha, bht, citric acid), parsley.contains: wheat, soy, milk. 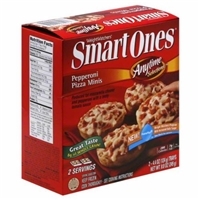 Brand/Manufacturer: Weight Watchers Russell Stover Candies, Inc.
Pizza crust (enriched flour [wheat flour, malted barley flour, niacin, iron, thiamine mononitrate, riboflavin, folic acid], water, whole wheat flour, oat fiber, sugar, yeast, rice flour, modified wheat starch, hydrogenated soybean oil [with citric acid], soybean oil [with citric acid], salt, garlic powder, dough conditioner [wheat starch, l-cysteine hydrochloride, ammonium sulfate, soybean oil], soy flour), tomato sauce (tomato puree [tomato paste, water], water, seasoning [modified tapioca and corn starch, sugar, dextrose, salt, onion, carrot fiber, spices, dehydrated romano cheese (sheep's and cow's milk, cheese cultures, salt, enzymes), garlic powder, paprika, citric acid)], reduced fat mozzarella cheese (part skim milk, non-fat milk, cheese cultures, modified cornstarch, salt, vitamin a), pepperoni (pork, beef, salt, spices, dextrose, seasoning [natural spice extractives, paprika oleoresin, natural smoke flavor, bha, bht, citric acid], lactic acid starter culture [milk], sodium nitrite).contains milk, soybeans, wheat. 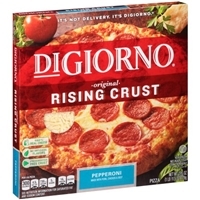 Crust: (wheat flour, water, corn oil, yeast, salt), whole milk mozzarella cheese: (pasteurized milk, cheese cultures, salt, enzymes), sauce: (tomato puree, water, oregano, salt, black pepper), sausage: (pork, salt, spices, flavoring), uncured pepperoni: (minimally processed, no artificial ingredients) no nitrates or nitrites added except for naturally occurring nitrates found in celery powder, pork, salt, contains 2% or less of cane sugar, natural flavorings (including celery powder), spices, oleoresin of paprika, lactic acid starter culture.allergen information: contains wheat and milk. 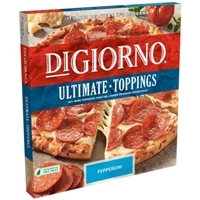 Crust: (wheat flour, water, corn oil, yeast, salt), sauce: (tomato puree, water, oregano, salt, black pepper), whole milk mozzarella cheese: (pasteurized milk, cheese cultures, salt, enzymes), sausage: (pork, salt, spices, flavorings), uncured pepperoni: no nitrates or nitrites added except for naturally occurring nitrates found in celery powder (minimally processed, no artificial ingredients), pork, salt, contains 2% or less of cane sugar, natural flavorings (including celery powder), spices, oleoresin of paprika, lactic acid starter culture.allergen information: contains wheat and milk. Crust: (wheat flour, water, corn oil, yeast, salt), whole milk mozzarella cheese: (pasteurized milk, cheese cultures, salt, enzymes), sauce: (tomato puree, water, oregano, salt, black pepper), uncured pepperoni: (minimally processed, no artificial ingredients) no nitrates or nitrites added except for naturally occurring nitrates found in celery powder, pork, salt, contains 2% or less of cane sugar, natural flavorings (including celery powder), spices, oleoresin of paprika, lactic acid starter culture.allergen information: contains wheat and milk. 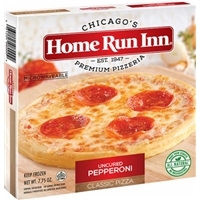 Crust (enriched bleached wheat flour [wheat flour, malted barley flour, niacin, ferrous sulfate, thiamine mononitrate, riboflavin, folic acid], water, soybean oil, salt, sugar, yeast), pizza sauce (vine-ripened fresh peeled diced tomatoes, tomato puree, salt, calcium chloride, spice, black pepper), low moisture part-skim mozzarella (pasteurized part skim milk, cheese cultures, salt, enzymes), pepperoni (pork, beef, salt, contains 2% or less of dextrose, flavoring, lactic acid starter culture, paprika, sodium nitrite, spices, bha, bht, citric acid), romano cheese (pasteurized sheep's milk, cheese cultures, salt, enzymes, anti-caking agent, [powered cellulose]), oregano leaves. 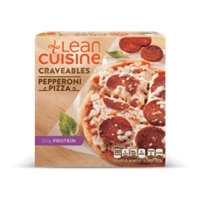 Unbleached enriched flour (wheat flour [niacin, reduced iron, thiamine mononitrate, riboflavin, folic acid]), water, reduced sodium low fat mozzarella (low fat mozzarella cheese [pasteurized part-skim milk, cultures, salt, enzymes], nonfat milk, modified food starch (ingredients not in regular mozzarella cheese), potassium chloride (ingredients not in regular mozzarella cheese)), reduced fat pepperoni (pork, water, soy protein isolate (ingredient not in regular pepperoni), salt, 2% or less of paprika, dextrose, spices, lactic acid starter culture, natural smoke flavor [maltodextrin, smoke flavor], sodium ascorbate, flavoring, sodium nitrite, bha, bht, citric acid), tomato paste, reduced fat mozzarella cheese (pasteurized part skim milk, nonfat milk, modified food starch (ingredients not in regular mozzarella cheese), cultures, salt, vitamin a palmitate, enzymes), sugar, less than 2% of margarine (partially hydrogenated soybean oil, palm oil, water, partially hydrogenated cottonseed oil, sugar, mono- and diglycerides, artificial flavor, soybean lecithin, potassium sorbate and citric acid [preservatives], colored with annatto and turmeric, vitamin a palmitate), fontina cheese (cultured milk, salt, enzymes), modified food starch, partially hydrogenated palm kernel oil (with soy lecithin), seasoning (bread crumbs [bleached wheat flour, dextrose, salt, yeast], dehydrated garlic, dehydrated onion, salt, whey, spice, autolyzed yeast extract, natural & artificial flavor), egg yolks, unbleached enriched flour (wheat flour, malted barley flour, niacin, iron, thiamine mononitrate, riboflavin, folic acid), seasoning (sugar, dehydrated garlic, dehydrated onion, salt, spice, potassium chloride, romano cheese [part skim cow's milk, cheese cultures, salt, enzymes], soybean oil, autolyzed yeast extract, natural flavor), dough conditioner (calcium sulfate, salt, l-cysteine hydrochloride, garlic powder, tricalcium phosphate, enzymes), yeast, salt, dough conditioner (distilled monoglycerides with ascorbic acid and citric acid [antioxidants]), soy lecithin, methylcellulose, whey, soy flour, egg whites, soybean oil.contains: wheat, milk, egg and soy ingredients. 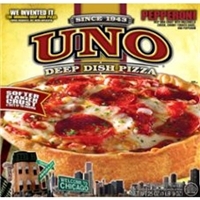 Enriched wheat flour (wheat flour, niacin, reduced iron, thiamine mononitrate, riboflavin, folic acid), water, low-moisture part-skim mozzarella cheese (part-skim milk, cheese culture, salt, enzymes), pepperoni made with pork, chicken and beef (pork, mechanically separated chicken, beef, salt, contains 2% or less of spices, dextrose, pork stock, lactic acid starter culture, oleoresin of paprika, flavoring, sodium nitrite, sodium ascorbate, paprika, natural smoke flavor, bha, bht, citric acid), tomato paste, tomatoes (tomatoes, tomato juice, calcium chloride), pepperoni (pork and beef, salt, spices, dextrose, lactic acid starter culture, oleoresin of paprika, flavoring, sodium nitrite, bha, bht, citric acid), bread crumbs (bleached wheat flour, yeast, sugar, salt), contains less than 2% of sugar, wheat gluten, vegetable oil (soybean oil and/or corn oil), yeast, salt, garlic, white corn meal, baking powder (baking soda, sodium aluminum phosphate), seasoning blend (salt, spice, dried garlic), datem, sodium stearoyl lactylate, extra virgin olive oil, ascorbic acid.contains: milk, wheat. 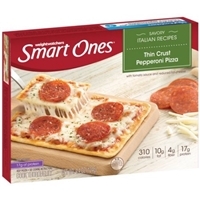 Pizza enriched wheat flour (wheat flour, niacin, reduced iron, thiamin mononitrate, riboflavin, folic acid), water, low moisture part skim mozzarella cheese (part skim milk, cheese culture, salt, enzymes), pepperoni made with pork, chicken and beef (pork, mechanically separated chicken, beef, salt, contains 2% or less of spices, dextrose, pork stock, lactic acid starter culture, oleoresin of paprika, flavoring, sodium nitrite, sodium ascorbate, paprika, natural smoke flavor, bha, bht, citric acid), tomato paste, shortening (partially hydrogenated vegetable oil [soybean and/or cottonseed oil], soy lecithin, natural flavors, beta carotene [color]), contains less than 2% of vegetable oil (soybean oil and/or corn oil), yeast, salt, sugar, baking powder (baking soda, sodium aluminum phosphate), seasoning blend (salt, spice, dried garlic), mono- and diglycerides, bread crumbs (bleached wheat flour, yeast, sugar, salt), fully cooked chicken breast chunk fritters with rib meat (chicken breast meat with rib meat, bleached wheat flour, water, modified corn starch, contains 2% or less of salt, dextrose, extractives of paprika and annatto, leavening [sodium aluminum phosphate, sodium bicarbonate], soybean oil, modified food starch, sodium phosphates, xanthan gum, carrageenan). Buffalo style sauce (water, cayenne pepper, distilled vinegar, soybean oil, salt, modified food starch, xanthan gum, sodium benzoate [preservative], potassium sorbate [preservative], garlic powder, guar gum, propylene glycol alginate, ascorbic acid, calcium disodium edta).contains: wheat, milk, soy. 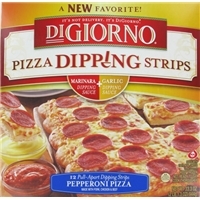 DIGIORNO® PEPPERONI PIZZA DIPPING STRIPS. A NEW FAVORITE! IT'S NOT DELIVERY. 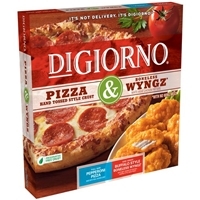 IT'S DIGIORNO®. MARINARA DIPPING SAUCE + GARLIC DIPPING SAUCE. REAL®. 12 PULL-APART DIPPING STRIPS. MADE WITH PORK, CHICKEN & BEEF. MADE WITH 100% REAL CHEESE. U.S. INSPECTED AND PASSED BY DEPARTMENT OF AGRICULTURE. Marinara dipping sauce (water, crushed tomatoes, tomato paste, sugar, salt, modified food starch, spices, garlic, distilled vinegar, natural flavor, garlic powder, evaporated cane sugar, citric acid). Garlic dipping sauce (water, soybean oil, modified food starch, salt, natural and artificial flavor [contains milk], lactic acid, garlic powder, xanthan gum, titanium dioxide [color], sodium benzoate and potassium sorbate [preservatives], partially hydrolyzed guar gum, oil of annatto [color], oleoresin turmeric). 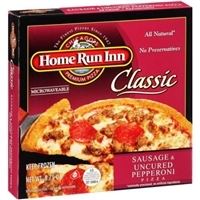 Pizza: enriched wheat flour (wheat flour, niacin, reduced iron, thiamin mononitrate, riboflavin, folic acid), water, low-moisture part-skim mozzarella cheese (part-skim milk, cheese culture, salt, enzymes), pepperoni made with pork, chicken and beef (pork, mechanically separated chicken, beef, salt, contains 2% or less of spices, dextrose, pork stock, lactic acid starter culture, oleoresin of paprika, flavoring, sodium nitrate, sodium ascorbate, paprika, natural smoke flavor, bha, bht, citric acid), tomato paste, shortening (palm oil, natural butter flavor, beta carotene [color]), yeast, contains less than 2% of vegetable oil (soybean oil and/or corn oil), bread crumbs (bleached wheat flour, yeast, sugar, salt), salt, sugar, baking powder (baking soda, sodium aluminum phosphate), seasoning blend (salt, spice, dried garlic).garlic dipping sauce: contains: milk. 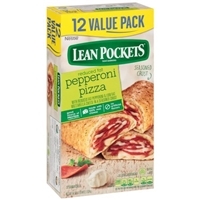 Pizza: contains: wheat, milk. 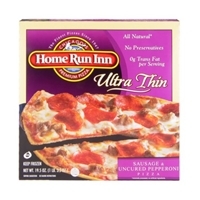 Enriched wheat flour (wheat flour, niacin, reduced iron, thiamin mononitrate, riboflavin, folic acid), water, low-moisture part-skim mozzarella cheese (part-skim milk, cheese culture, salt, enzymes), pepperoni made with pork, chicken and beef (pork, mechanically separated chicken, beef, salt, contains 2% or less of spices, dextrose, pork stock, lactic acid starter culture, oleoresin of paprika, flavoring, sodium nitrite, sodium ascorbate, paprika, natural smoke flavor, bha, bht, citric acid), tomato paste, sugar, 2% or less of wheat gluten, vegetable oil (soybean oil and/or corn oil), degerminated white corn meal, yeast, salt, degerminated, yellow corn meal, seasoning blend (salt, spice, dried garlic), baking powder (baking soda, sodium aluminum phosphate), datem, sodium stearoyl lactylate, ascorbic acid (dough conditioner).contains: milk, wheat. Pizza must be cooked thoroughly to 160 degrees f for food safety & quality. Do not allow pizza to thaw. Do not eat pizza without cooking. 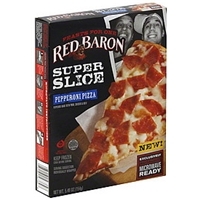 RED BARON??? FEASTS FOR ONE SUPER SLICE PEPPERONI PIZZA. FEASTS FOR ONE. PEPPERONI MADE WITH PORK, CHICKEN & BEEF. REAL??. MADE WITH 100% REAL CHEESE. U.S. INSPECTED AND PASSED BY DEPARTMENT OF AGRICULTURE EST. 7645K. INDIVIDUALLY WRAPPED. NEW! EXCLUSIVELY PREPARED. MICROWAVE READY. 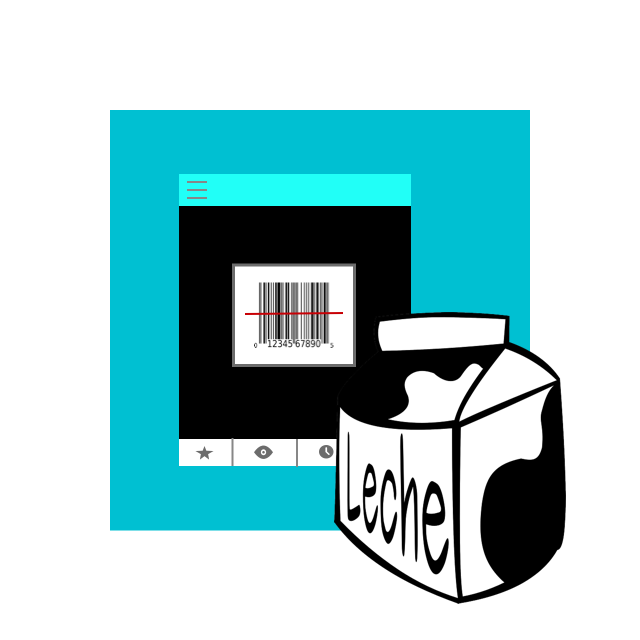 Enriched flour (wheat flour, malted barley flour, niacin, reduced iron, thiamine mononitrate, riboflavin, folic acid), tomatoes (water, tomato paste), low moisture part skim mozzarella cheese (cultured pasteurized part skim milk, salt, enzymes) part skim mozzarella cheese ([pasteurized milk, cultures, salt, enzymes], modified food starch), pepperoni made with pork, chicken and beef (pork, mechanically separated chicken, beef, salt, contains 2% or less of spices, dextrose, lactic acid starter culture, oleoresin of paprika, sodium ascorbate, natural smoke flavoring, flavoring, sodium nitrite, bha, bht, citric acid), skim milk, bread crumbs (bleached wheat flour, sugar, yeast, salt), contains 2% or less of: yeast, vegetable oil (soybean, cottonseed, corn and/or canola oil), butter flavored shortening (soybean oil, palm oil, fully hydrogenated cottonseed oil, mono and diglycerides, natural butter flavor and beta carotene), sugar, salt, modified food starch, isolated oat product, guar gum, baking powder (sodium acid pyrophosphate, sodium bicarbonate, corn starch, monocalcium phosphate), wheat gluten, spices, maltodextrin, sodium stearoyl lactylate, hydrolyzed soy and corn protein, paprika, garlic powder, defatted soy flour, mono- and diglycerides, l-cysteine, enzymes.contains: wheat, milk, and soy.